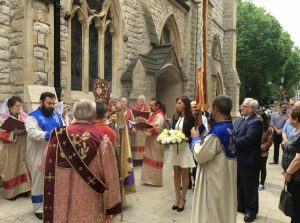 :: On Sunday, May 28th, 2017, his grace Bishop Hovakim Manukyan presided over a “Hokehankist” Special Prayer Service at St. Yeghiche Armenian Community Church in memory of the 22 innocent victims of the Manchester bombing of 22nd May, 2017. Prayers were also said for the 28 Coptic Christians killed in an attack on them in El-Minya in Egypt on the 26th of May 2017. On the occasion of the celebration of the 99th Anniversary of the Independence of the First Armenian Republic on the 28th of May, 2018, prayers were also said for all the Armenian soldiers who gave their lives for the independence and glory of the first Republic of Armenia at the battle of Sartarabad between the 21st and 29th of May 1918. At the Special Memorial Ceremony the Armenian Embassy was represented by Consul Ms Hayarpi Demeyan, and on behalf of the Armenian Community Council of the United Kingdom (ACC UK) present were Mr Ara Palamoudian, Chairman of the ACC UK, Mrs Matilda Megerdichian – Member of the ACCUK and Chair of the Council’s Executive Committee, Mr Viken Haladjian – Member of the ACCUK and Chairman of the St Yeghiche Armenian Community Church Parish Council, and ACCUK Members Dr Setrag Karanfilian and Dr Stepan Tatulian.